This addon allows you to easily look up any item by name or ID. As an added bonus, it also can attempt to show you all qualities of an item and show you the text makeup of an item's link. /finditem will take the piece(s) of the name you enter and return search results of just those items. This can contain spaces, multiple words, punctuation (such as "mother's sorrow"). 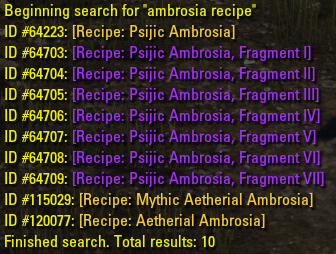 If you just feel like browsing through a section of items (the limit is 100 at a time), then you can use "/finditem <start id>" such as "/finditem 64223" to begin browsing data at Psijic Ambrosia Recipe and on. Note: The item table is rebuilt once per session for a myriad of reasons. The below is for more advanced searches and is not required for simple usage. Using "trait:<trait_name>" will narrow the search to that trait. 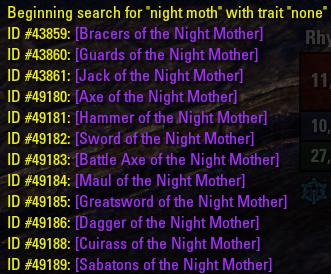 For example: Night Mother gear in divines could be found with "/finditem night mother trait:divines" or you can shorthand it "trait:div"
Axe, Bow, Dagger, Mace, Shield, Sword are exactly as you'd expect. The following are the code name you'll need to use (capitalization doesn't matter) for the other types: Fire, Frost, Lightning, Healing, BattleAxe (for a 2h axe), Maul (for a 2h mace), Greatsword (for a 2h sword). Like weapon type, this also uses the "type:<slot_name>" flag and you can only use one type flag at a time. Name the body part: Head, Hand, Feet, Legs, Necklace, Ring, Shoulders, Waist. If you want to also sort by weight (e.g. "light"), see the flag below. If you want to search for light, medium or heavy, you'll need the "weight:<weight_name>" flag. This can (and should) be used in conjunction with the equipment type flag. If you want to skip the hassle of combining the usage of type and weight, then you can use the weighted type keywords. For example, if you want to find a Julianos sash, you can do "/finditem julianos type:waist weight:light" or you can use "/finditem julianos type:sash"
If you're not great with names, you can call the wrong type (e.g. calling it a "belt" instead of a "sash") and include the weight you want. Such as "/finditem julianos type:belt weight:light" will still return the sash. Light: Hat, Robe, Shirt, Epaulets, Sash, Breeches, Shoes, Gloves. Medium: Helmet, Jack, ArmCop, Belt, Guards, Boots, Bracers. Heavy: Helm, Curiass, Pauldrons, Girdle, Greaves, Sabatons, Gauntlets. Note: I do not believe robe and shirt have a means of distinguishing them besides their name. I'm assuming this may cause issues for non-English clients. If it does, use "type:chest weight:light" instead and you'll have to deal with shirts and robes being shown, but you can help by including "robe" or "shirt/jerkin" in your language as a search term. /showitem does the opposite: it takes an item's ID and returns the item. /breakitem will take an item link and dismantle it in your chat input so that you can modify it as you wish or simply read it. Submitting it will reconstruct it back into an item link (with whatever modifications you made being applied). /gradeitem will attempt to take any item with a changeable quality and output all qualities of the item. If it doesn't work on an item, please post the item's data (/breakitem [item_link], then copy what it returns). The addon defaults to attempting to show results as CP160, legendary quality. /ifsetquality will take an item link's quality AND level. It is a character specific setting. If you have an item of the level you wish to specify but not the quality, simply use /gradeitem [item] to get all of the qualities and then use the relevant resulting quality as the item link for this command. This functionality is for devs. /ifdump has two options: "furniture" and "provisioning"
It will find every item that falls into that recipe category and write it to saved variables. Due to string length limitations, it will appears as multiple entries. Simply concat the data strings by numeric order of the name and you will have your reference table. You could always ask me if need be, but the more on demand option is /ifhelp. The command will return usage instructions for the aforementioned commands. Version 1.10 - Added recipe dump function. Version 1.06 - Added pre-weighted items to type flag. Version 1.05 - Added filtering by type and weight. Added "none" type. Improved the "beginning" text. Version 1.04 - Added filtering by trait. Version 1.03 - Added trait to applicable items. Version 1.02 - Added id only searching. Version 1.01 - Added /ifsetquality. Found a little bug. If you search for items with "-" in the name you have to search for "--" to make it work. There are some german items like "Trübmoor-Rampe" that includes that "-" problem. So to find that item in german client you have to search for "Trübmoor--Rampe". Sets as in physical items? Yes. But it doesn't do costumes. Excellent addon, I love it. Do you know if there is a way to dump all items to saved variables. And with all items I mean ALL items. It would help me with a future project. I didn't notice this question: the lua files tend to get unstable around 10k records in a list. There are around 140k item ids, but let's say only 100k are in use. I'd have to set it up to make multiple lists in an effort to not break. Probably not impossible, but nothing something that is implemented. That doesn't currently work for you? Last edited by Rhyono : 04/22/18 at 05:43 PM. Would you be able to add a option to do trait: none? Thanks! I was originally trying to find a few IDs, saw yours and figured I could make an improved version. So I added multi-term searching, then I expanded the search range and ran into the crashing. After getting it resolved via time delayed cycling, I now had the problem of the chat system limiting lines to ~150 or so, which required limiting output. It quickly grew from "I can make a slightly better version" to "I can see why he didn't bother." It turned out, though. Very helpful, thanks! 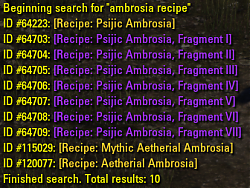 Already used it to mine the ID's for the new recipes when updating Master Recipe List. I had something similar but it caused the game to crash searching more than 99k ID's at a time, and I was too lazy to set up a cycling array that took it in chunks. The extra options will likely come in handy as well. Nice work.